Hey, everyone. No episódio de hoje, eu falo sobre tablóides e suas notícias aqui na Inglaterra. Hey everyone! How’re you doing? Here’s a new episode of the Inglesonline podcast. Please subscribe to this podcast using the Podcasts app for iPhone or iPad, or listen to the episodes using the Inglesonline Android app. To download or just listen to the other episodes and download transcripts, go to inglesonline.com.br and click Podcast Inglesonline. 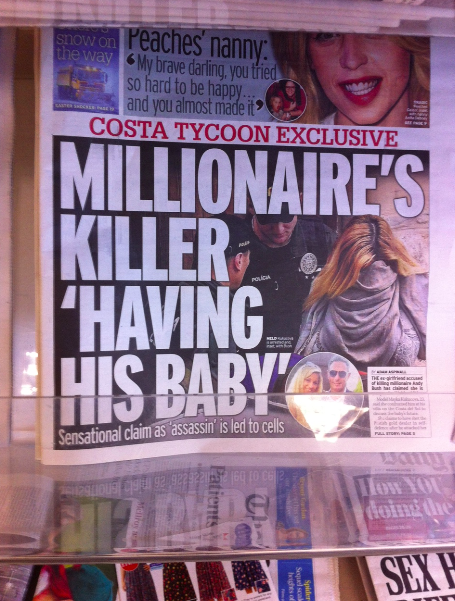 So last week on my way out of the supermarket I glanced at the tabloid covers, as I always do, and spotted this headline: Millionaire’s killer having his baby. That’s right: this millionaire British guy called Andrew Bush was supposedly killed by an ex-girlfriend, and she now says that she’s pregnant with his baby. But wait! There’s more. Andrew Bush, 48, had a new girlfriend: Maria, a twenty-year-old girl from Russia. So they had been dating for a few months, after he broke up with his former girlfriend, Mayka, who’s 24. So this girl Mayca is the ex-girlfriend and she’s from Slovakia, a country in Eastern Europe. So here’s the story on the newspapers: Mayca and Andrew Bush had a relationship for a couple of years and one day they split up. Andrew then went on to date 20-year-old Maria. So a few days ago Andrew and Maria went on holiday to his mansion in Costa del Sol, Spain – but the thing is, apparently the ex-girlfriend Mayca showed up uninvited and shot the millionaire dead. Maria, the new girlfriend, was in the car outside the house when she heard the gun shots. So how do they know Mayca is the killer? Because she apparently turned herself in a few days later in her native country, Slovakia. She turned herself in – what does that mean? That means she went to a police station of her own free will, voluntarily, and presented herself for questioning. Well, she probably felt she didn’t have much of a choice, right… Maria, the current girlfriend, saw Mayca at the mansion and there were probably other witnesses as well, so… that puts Mayca pretty high on the suspect list. So that’s what she did after she got to Slovakia: she turned herself in to the Slovakian police. And, there’s more! According to the headline I read last week, Mayca is now saying she’s pregnant and Andrew Bush is – or was… the father. I’m not all caught up on the details so that’s all I know up to this point. So here’s a couple of examples* I’ve found on the Internet with “turn yourself in”: Richmond homicide suspect turns herself in to San Francisco police. And this one: Woman accused of stealing 300 thousand dollars from church turns herself in. How about a few examples in Brazil? I can’t think of anyone off the top of my head. Can you remember any examples of criminals in Brazil who have turned themselves in to the police? Please let me know in the comments. So I can tell you that here in England there are quite a few popular tabloids and I remember a Brazilian tabloid called “Notícias Populares”. Is that one still around? So a tabloid is a newspaper, right? But I guess we could say that tabloids give the news in a more sensational, or sensationalist format. Tabloids have more of an entertainment purpose, I guess, then regular newspapers. What’s the weirdest tabloid headline you have ever read? Let us know in the comments, as always, and talk to you next time! Nota*: O correto seria “Here ARE a couple of examples…”. A maneira como eu falei, “Here’s a couple of examples…”, é muito comum na fala coloquial mas não está rigorosamente correta em sua concordância. When listening this podcast I remembered of history that happened a few years ago here in Brazil. A big businessman was killed by his wife because him was unfaithful. But was the police investigation revealed who was killer. obrigada, Ana pelo seu blog .É muito enriquecedor estou aproveitando o máximo.Parabéns e muito obrigada. É um prazer, Marizete :) Aproveite mesmo! In my opinion, here in Brazil, people don’t usually turn themselves in. All kinds of crimes are committed and judging by the laws that there are in our country it is believed you may get away with it. Unfortunately this happens in all walks of life. It’s sad but true. Agreed. I’ve had a hard time thinking of any Brazilian criminals who’ve turned themselves in. Previous Post Inglês com Cartoons #96: We’re going to the beach Next Post ‘Essa sexta’ em inglês é This Friday ou Next Friday?